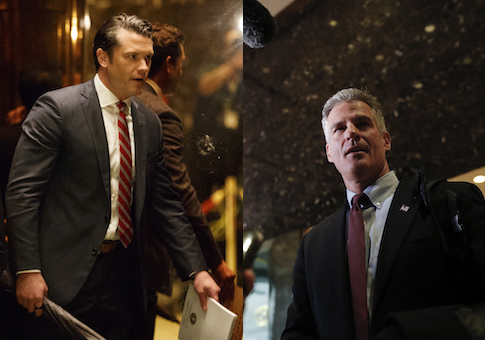 President-elect Donald Trump is said to be considering former Massachusetts Sen. Scott Brown (R.) and Pete Hegseth, an Army veteran and former CEO of Concerned Veterans for America, to lead the Department of Veterans Affairs. The selection of VA secretary is one of Trump's most anticipated moves, as the new leader will be tasked with reforming a government hospital system in need of "system-wide reworking." The selection list for the cabinet post has narrowed to Brown and Hegseth, sources told the Washington Free Beacon this week. Both have met with the president-elect at Trump Tower in New York in the past few days. Trump has pledged to "transform" the VA to deliver more timely, effective health care to the nation's veterans. The VA under the Obama administration has been criticized for not doing enough to address long wait times and poor care at its network of hospitals. The agency has been criticized for other shortcomings, including its failure to punish employees for misconduct. The current VA secretary, Robert McDonald, replaced Eric Shinseki following his resignation in 2014 after it was revealed that veterans died waiting for care at the Phoenix VA hospital. An independent assessment commissioned by the VA and released last September found the VA's network of hospitals trapped in crises in leadership and culture warranting "system-wide reworking." Both Brown and Hegseth have military backgrounds. Brown, who served in the Army National Guard and worked on veterans issues as a Massachusetts state senator, met with Trump last Monday to discuss veterans health care and challenges facing service members returning from overseas, according to a readout of the meeting provided by Trump's transition team. Brown told reporters after the meeting that he would be the "best person" to the lead the VA.
Brown told journalists that he would prioritize eliminating waste from the VA's budget and tackling veterans' suicide and mental health care. "The VA can't do it all," Brown said following the meeting. "We're going to have to outsource some of those cases to private vendors, obviously. We've got the work with the Department of Defense so when that soon-to-be-veteran actually leaves the DoD, we know what his or her needs are. There's a breakdown there." Brown pursued a career in law before entering politics in the early 1990s. He won election to the U.S. Senate seat vacated by late Massachusetts Sen. Ted Kennedy (D.) in 2010, but lost it two years later to Democratic Sen. Elizabeth Warren. Brown also ran unsuccessfully for U.S. Senate in New Hampshire in 2014. Hegseth is not a politician and has worked extensively on veterans' issues. He was CEO of Concerned Veterans for America, a conservative group advocating VA reform, between 2012 and 2015 and was executive director of Vets for Freedom before that. Hegseth, now a Fox News contributor, is a decorated Army veteran of the wars in Iraq and Afghanistan and served as a guard at the military prison at Guantanamo Bay Naval Base, Cuba. Hegseth met with Trump in New York on Tuesday, exiting Trump Tower holding Concerned Veterans for America's policy proposal for VA reform, according to an image captured by the Associated Press. Hegseth did not return a request for comment about his consideration for the position or his Tuesday meeting with Trump. Brandon Coleman, a VA employee who exposed substandard mental health care at the Phoenix VA in 2014 and knows Hegseth, told the Free Beacon that he would be well-suited for the position. "He supports veterans having a choice where we get our health care either at VA or in the community," Coleman said Wednesday. "The secretary of the VA needs to be a veteran not afraid to think outside the box, not afraid to use community providers to help enhance the VA and allow veterans the choice of when and where we receive care." Several other names have been floated as possible picks to head the VA. Rep. Jeff Miller (R., Fla.), who currently chairs the House Committee on Veterans Affairs but is retiring at the end of this year, was rumored to be an early favorite for the position. Trump indicated in July that he would consider the congressman for the job. Miller has not met with Trump in New York over the past several weeks. A source with knowledge of the situation told the Free Beacon that the outgoing representative is "not in the running" for the top cabinet post. Miller, who does not have a record of military service, has spent much of his eight terms in Congress advocating for veterans. He became chairman of the VA committee in 2011 and played a large role in passing the $16.3 billion legislation reforming the federal agency after the 2014 wait list scandal. Miller has continued to highlight waste and misconduct at the agency and pursue reform. He introduced reform legislation to expand the VA's firing powers that passed the House with bipartisan support in September. An aide for Miller told the Free Beacon that the congressman is focused on his work as chair of the VA committee and representing Florida's 1st congressional district, and that he is "fully supportive" of Trump's vision for reforming the VA.
Miller described the prospects for VA reform under the Trump administration as "significant" in a statement to the Free Beacon. "Instead of trying to sugarcoat VA's challenges like the Obama administration has done for much of the last eight years, President-elect Trump will fight hard to overcome them," Miller said. "And instead of catering to the special interests that are blocking efforts to address VA's number one problem–its notorious lack of accountability—President-elect Trump has made clear that reforming the department's broken civil-service system is a top priority." Trump, who enjoyed support among veteran and military voters during the general election, said he is committed to improving the VA and delivering "state-of-the-art" health care to the nation's service members. According to Trump's 10-point plan for veterans outlined in July, he plans to appoint a VA secretary "whose sole purpose will be to serve veterans" and who will not place the needs of "D.C. bureaucrats" over those of the nation's service members. Trump plans to remove bad-behaving VA employees, establish a commission to investigate wrongdoing at the federal agency, and allow veterans to see care at the VA or any private doctor, in addition to other reforms. The Trump transition team did not return a request for comment on the ongoing process of selecting a VA secretary. It is unclear when Trump will nominate a candidate to lead the VA or other key agencies such as the Departments of Defense and State. Republican National Committee spokesman Sean Spicer told reporters on Wednesday morning that he does not anticipate any further cabinet nominations this week. This entry was posted in Issues and tagged Donald Trump, Scott Brown, Veterans Affairs. Bookmark the permalink.